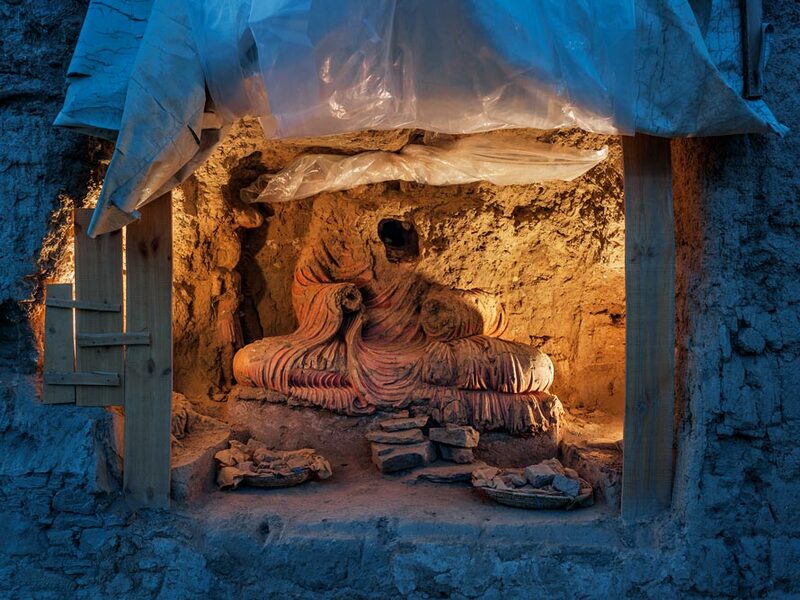 Searching for treasure, looters ravaged this larger-than-life Buddha. “Archaeology is the only way to protect the site,” says Philippe Marquis, who oversaw excavation until 2014. War brought to light hidden Buddhist history. Where was the Buddha born and raised? 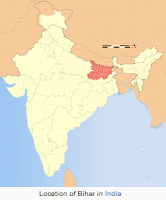 He was raised in the three seasonal capitals of Shakya Land, or the "Land of the Shakya Clan," ancient Scythia, modern Afghanistan, not Nepal (see ranajitpal.com). 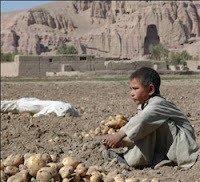 Boy gathers potatoes in Bamiyan (W). 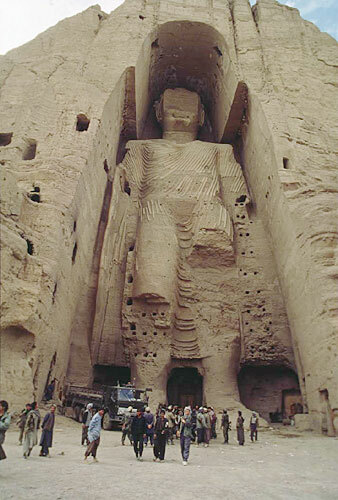 The texts describe Kapilavastu (Bamiyan, along the Himalayan foothills of the Hindu Kush), where young Prince Siddhartha Gautama had one seasonal palace. But the texts refer to two others appropriate to the three traditional seasons: hot, rainy, and cold. 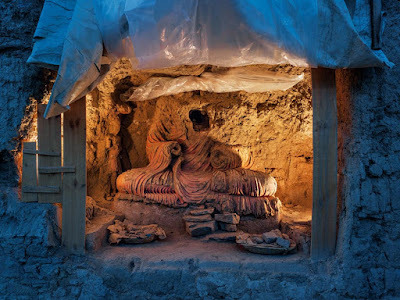 The two other locations for palaces were likely modern Kabul and Mes Aynak. The Shakyans, led by King Suddhodana, Prince Siddhartha's father, were well aware of the prince's renunciation and travel to the east to "India." (There was in fact no such place as "India" at the time; there were loosely affiliated kingdoms and republics 300 years before Emperor Asoka united them. There had been a Bharat; the Buddha spoke of Jambudvipa, this continent or planet or section of the galaxy, "the Rose Apple Land"). 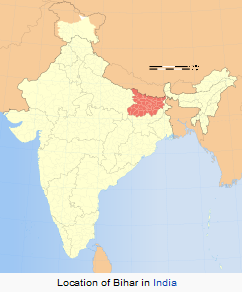 Prince Siddhartha traveled to the Kingdom of Magadha and then to what is now called Bihar (after the Buddhist word for temple complex, vihara) and Bodh Gaya ("Enlightenment Grove"), where the wandering ascetic Siddhartha became the Buddha, the "Awakened One." His father the Shakyan king kept tabs on the renunciant Siddhartha through emissaries for the seven years he was gone on his spiritual quest. 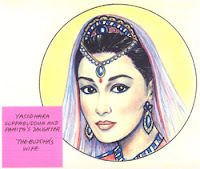 His wife, Bimba-devi (Rahula Mata, Bhadda Kaccānā, who like most figures in Buddhism is best known by her descriptive name Princess Yasodhara), was also well aware of Siddhartha's whereabouts, so much so that she took on whatever austerities he engaged in. 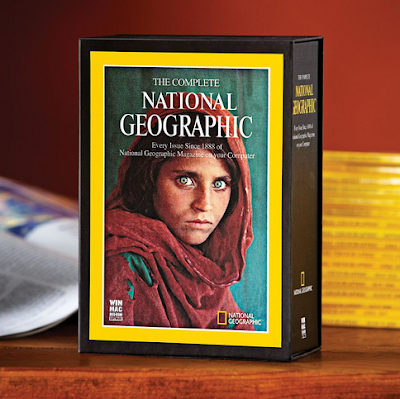 For example, when he wore saffron robes, slept on the floor, and took only one meal a day, she did the same. She was stuck in the luxurious palace with the royal family raising their son, Prince Rahula, next in line to rule. The faces of ancient local figures depicted in painted clay evoke a time when Mes Aynak was a crossroads of Central Asia. 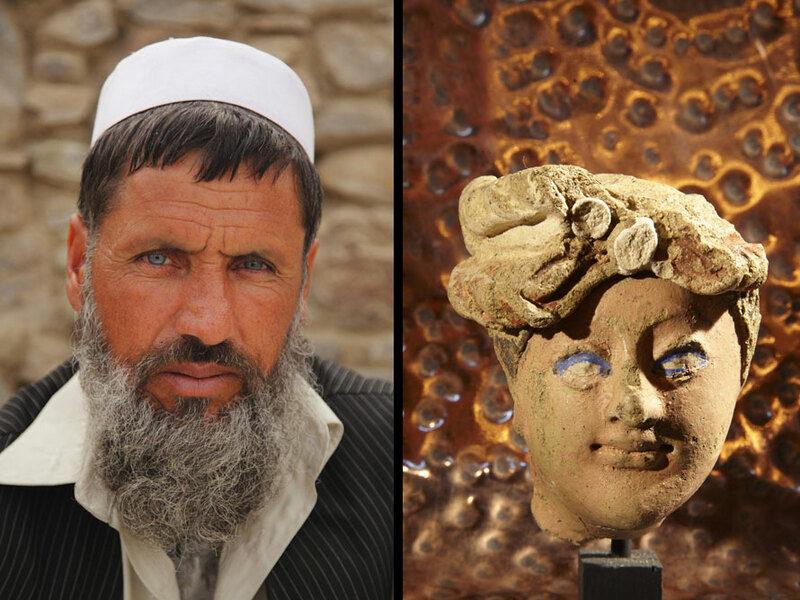 Left: A member of the archaeological team working to save the rich cultural heritage of Mes Aynak. Patron (R), 2.8 inches, 4th-7th century, Kabul Museum. Some 500 local laborers were employed at the site in 2012, hurrying to rescue its treasures before Chinese mining was due to begin. With mining delayed, a smaller crew works today in an area where insurgent influence is growing. Panorama composed of three images: Archaeologists have unearthed a neighborhood of mud-brick houses, craft workshops, and possible administrative buildings. Shah Tepe, looming in the center, was fortified but bore few signs of violence (Simon Norfolk). 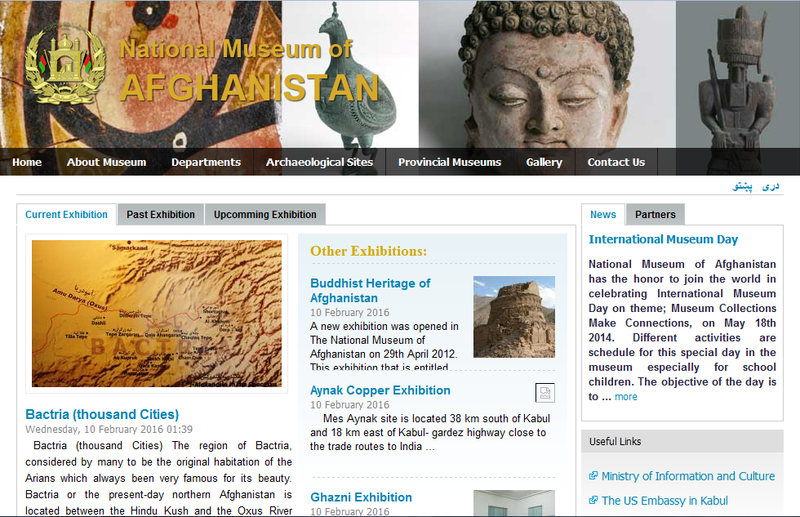 Mega copper deal [with Chinese] in Afghanistan fuels rush to save ancient [Shakyan Buddhist] treasures. Under threat of Taliban attack, archaeologists are excavating a spectacular Buddhist complex before it’s obliterated by a huge mining operation [after gold and rare earth minerals]. About an hour’s drive along the Gardez Highway south of [the current capital of Afghanistan] Kabul, beyond the bustling shops, the trucks spewing diesel exhaust, and the clatter of donkey carts, there is a sharp left turn onto an unpaved road. In a district of Logar Province friendly to the Taliban, the vicinity has been shaken by roadside bombs, intermittent rocket attacks, kidnappings, and murders. The road continues along a dry riverbed, past small villages, paramilitary roadblocks, sentry towers, and an empty, blue-roofed compound cordoned off with concertina wire. A little farther on, the view opens onto a treeless valley creased with trenches and exposed ancient walls. 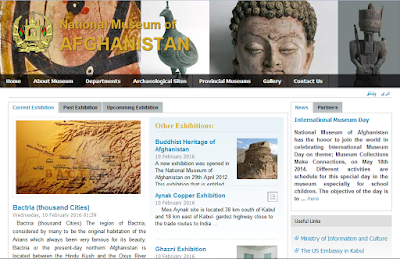 Over the past seven years a team of Afghan and international archaeologists, supported by up to 650 laborers, has uncovered thousands of Buddhist statues, manuscripts, coins, and holy monuments [sacred scriptures]. 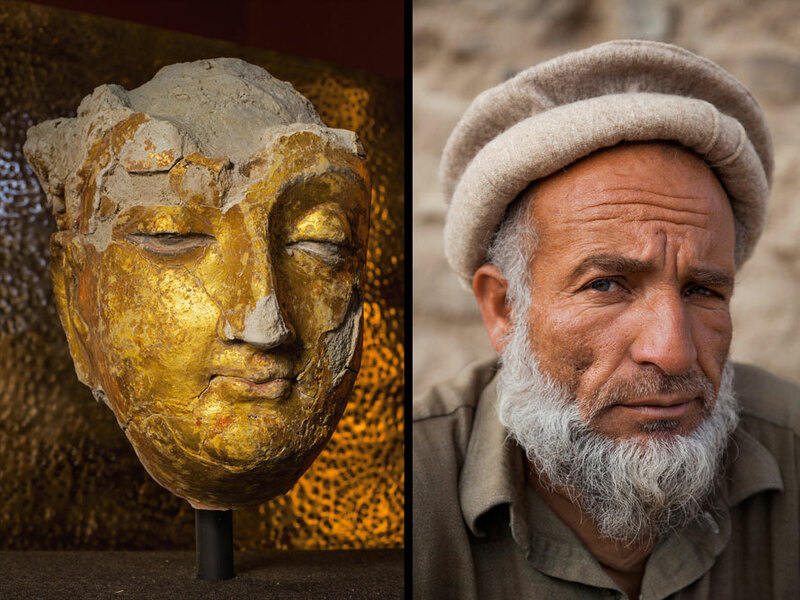 The team of archaeologists working to preserve Mes Aynak uncovered a life-size gilded plaster head of the Buddha (left). A modern Muslim laborer on the team is shown at right. Entire [Buddhist] monasteries and fortifications have come to light, dating back as far as the third century a.d. More than a hundred check posts surround the site, which is patrolled day and night by some 1,700 police. The excavation is by far the most ambitious in Afghanistan’s history. But the security wasn’t put in place just to protect a few scientists and some local workers. 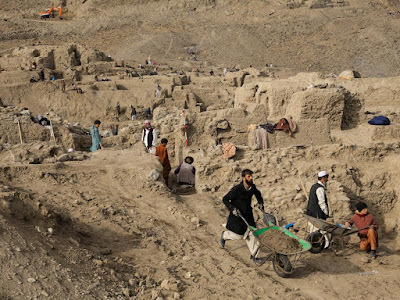 Buried below the ancient ruins is a lode of copper ore that extends two and a half miles across and runs a mile or more into the Baba Wali mountain, which dominates the site. It ranks as one of the world’s largest untapped deposits, containing an estimated 12.5 million tons of copper. 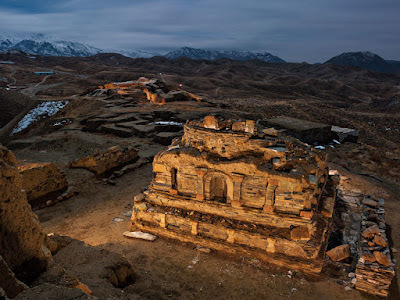 In antiquity, copper made the Buddhist [temples] here wealthy; colossal deposits of purple, blue, and green slag, the solidified residue from their smelting, spill down the slopes of Baba Wali, attesting to production on a nearly industrial scale. The Afghan government hopes that copper will help make the country wealthy again, or at least self-sufficient. 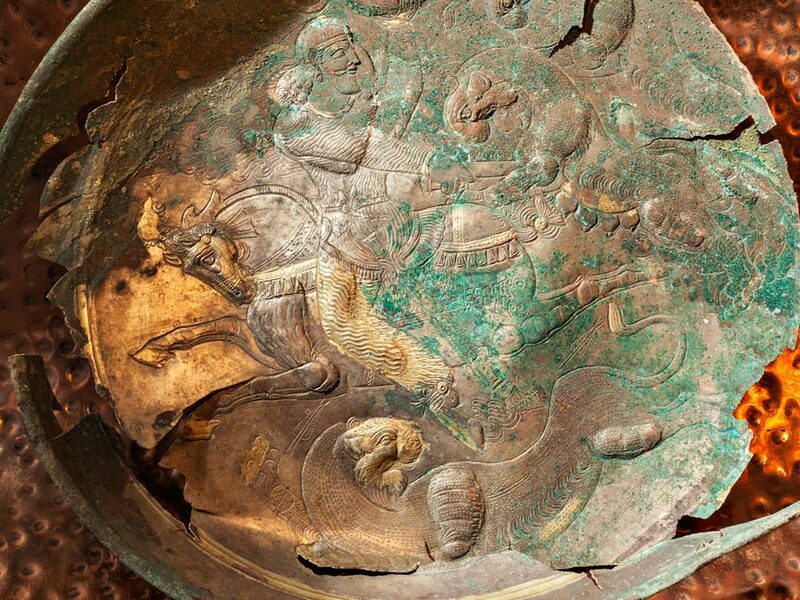 Detail of copper and gold bowl from Tepe Baba Wali, Mes Aynak depicts a snarling lion. 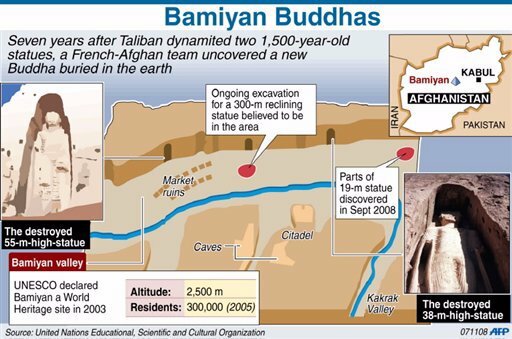 The name of this place is understated: Mes Aynak, “little copper well.” There is nothing little about Mes Aynak. In 2007 the Beijing-based China Metallurgical Group Corporation (MCC), leading a state-backed consortium, won rights to extract the copper here on a 30-year lease. (China is ravenous for copper: It now consumes half the world’s supply.) The company made a bid worth more than three billion dollars and promised to provide infrastructure for this isolated, underdeveloped district, including roads, a railway, and a 400-megawatt electricity plant.